What Is I Ching Hexagram 43 All About? Hexagram 43 yijing shows that opportunities are possible through the weakness in others. When someone has failed by using negative tactics, use the moment to take the lead to success. Also, this does not mean taking advantage of the weakness of others. It means taking the opportunity to take what was tainted with evil intent. And, change it into something much more positive. When taking hold of the reins, make sure to do so honorably. And, never think to use the same negative tactics that your enemy might have used. 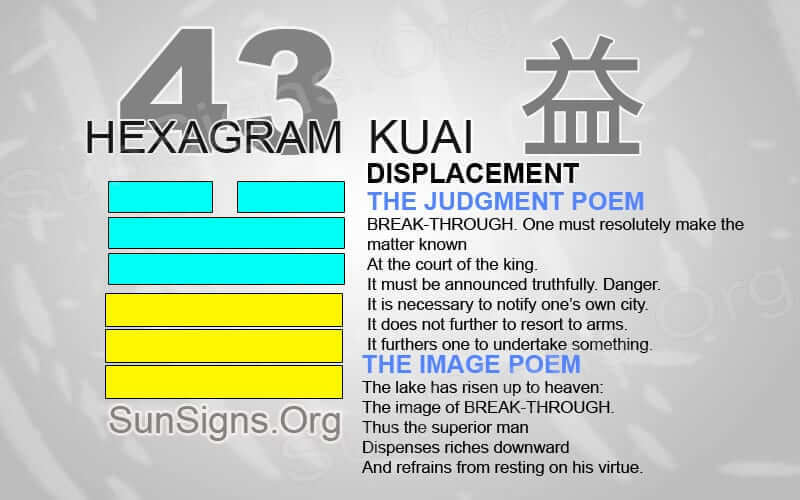 Hexagram 43 at first understanding can sound harsh or cruel. But it gives wisdom on how to handle a situation when a negative person has failed in a task. You as an individual can now take advantage of it. There might be some reasoning for someone’s actions. When an individual acts out harshly and uses wrongful maneuvers to attempt success, they will never be able to obtain what they desire. Then, the time comes for these types of people to show their weakness of using incendiary devices. It is then time for the honorable to take over the situation and to turn into something positive. Standing for what you believe to be right will be the key when dealing with this type of adversity. The most important part of dealing with this situation is strength. Refrain from using the same methods as the person who caused the problem in the first place. Utilizing negativity is not a solution to a problem or a means to progress. The meek and humble will inherit the earth. It is the responsibility of those who understand the right to stand up. When possible fix the wrongdoings of others. You will get this type of challenging opportunity to fix a problem caused by another’s weakness to do evil. Take on the situation with a clear mind and with strong morals. Stand up for others. Representing the right decision can be difficult when others might try to take you down by resorting to evil deeds. It is unrealistic to think that evil and negative actions don’t inhabit the world and occur on a daily bases. Everyone is born with the ability to make a choice. Often than not, the actions of others are often influenced by one thing or another. This will even affect your relationships. Handle it well with patience and understanding. Hexagram 43 shows that an opportunity is about to arise that will give an individual the opportunity to make things right. Though, it can be especially difficult to fix the problems others have inflicted in the progress of either a business or event in the community. No matter what type of setting the opportunity presents itself, it is important to handle the situation correctly to make a difference. It is necessary to notify one’s own city. Hexagram 43 is sometimes hard to understand when it describes the opportunity that is about to present itself. The most important thing is to enter into the new situation with an open mind and a strong heart. Be willing to work with others who show a great weakness. Find positive answers that are going to turn the situation around. At all times, be prepared to stand up for what is understood to be the right. Help others who might have been overshadowed by darkness for too long.